Greetings everyone! As you all know, Misty over at Book Rat is hosting Jane In June. If there's one thing I love more than Jane Austen, it's convincing other people to read Jane Austen. So I decided to put together a special prize pack for those who have never tried Austen but want to, or for those who are looking for a special edition of Austen's major work. Fair readers, your eyes do not deceive you. I figure once you read Austen's work, you'd want an overview of some of her best quotes and the opportunity to reflect on what you'd read (or perhaps write about the gentlemen you danced with at the most recent ball). So I decided to giveaway a Barnes and Noble leatherbound classics edition of Jane Austen: Seven Novels (containing Pride and Prejudice, Persuasion, Sense and Sensibility, Northanger Abbey, Mansfield Park, Emma and Lady Susan), a copy of The Wit and Wisdom of Jane Austen and a Jane Austen Journal. One lucky winner will receive all three of these items. Interested? Just check out the rules and fill out the form below. *One winner will receive all three items listed above. *The giveaway ends on June 30th at 11:59 p.m. 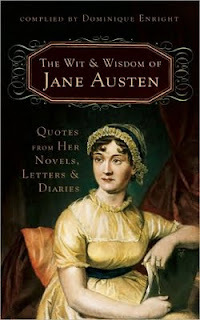 I have amazingly never readJane Austen--this would be the perfect opportunity! Thanks (and I love the journal). Oh, I'm so jealous of whoever wins this. SO. LOVELY. That collection of Austen novels looks GORGEOUS!! awesome prize pack filled with jane goodness - woot! Awesome prizes! Thanks for the chance!